FIMITIC promotes the equalisation of opportunities for disabled persons and fights against their discrimination. Dignity and justice for all of us. The Socio-political Seminar has pointed out the urgency of discussion on the treated subject and of further on Carrying out the dialogue and the corresponding actions. From the Irish point of view, the PwDI Chairman Mr. James McClean and the Chief Executive Mr. Michael Ringrose underlined the priority need for access to information and communication technologies to everyone in society, but perhaps no-more so than persons with disabilities, creating opportunities to them. If available to everyone, information technologies facilitate individuals in reaching their full potential and it enables people with disabilities to play their part in societyÂ´ s development. The FIMITIC Award presentation for an example of good practice, the FIMITIC Gold medal, was presented during the festive Gala dinner by the FIMITIC President Nigel Brander to Aura Sports and Leisure Management for its excellent approach to provide a culture of inclusion to all people with disabilities, both employees and customers. Participants from 14 FIMITIC member countries were in attendance. 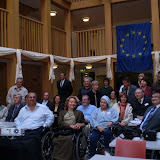 The member associations are urgently asked to make the current discussion and the presented concerns known in the individual member countries and to contribute to bring about tangible discussion progress and ways for solution in advancing e-technology especially also for disabled people. - Dr Mihaly Derera: A UNIQUE PROJECT. Copyright FIMITIC 2011, All rights Reserved.